As a business owner, you’re always thinking five steps ahead. In order for your business to be successful, you not only have to focus on what’s happening right now, but also plan for the future. You constantly have to think about ways you can make your operations more effective and profitable. Part of that is maintaining and making improvements to your commercial property, like installing 3M Window Film. Kansas City office buildings, retail stores, hotels, schools, and transit systems can all benefit from 3M Window Film. 3M Window Film provides numerous advantages that can help make businesses more successful, from reducing energy use and improving sustainability to creating a more comfortable atmosphere for clients and employees. Below, we’ve described some of the benefits. Running a business is no easy task. 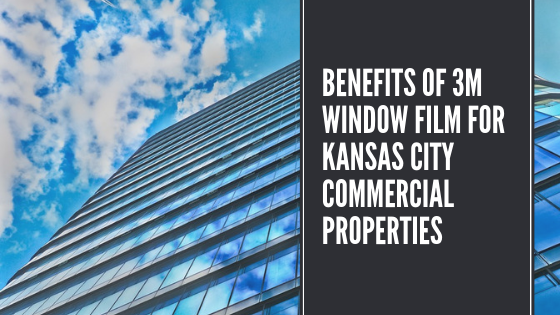 Here’s some of the ways that 3M Window Film for your Kansas City commercial property may be able to make your life a little bit easier. What business doesn’t want to save money? Figuring out how to do so is usually the question. But 3m Window Film, saving money becomes easy. 3M Window Film cuts down energy costs by up to one third each year. For a large commercial property, that’s potentially hundreds of dollars that can be saved and reinvested back into other important matters. Starting a business isn’t only time consuming, it’s also expensive. Businesses pay a lot of money for rental costs, equipment, and supplies. The last thing that you want is for all your expensive furniture and electronics to be stolen due to poor security. Keep your building secure 24 hours per day with 3M Window Film in Kansas City. 3M Window Films provide a fast solution for enhancing office aesthetics from the inside out. Add frosted film to your conference room for privacy or refresh your exterior with an exterior glass resurfacing film. With 3M, you can every room, wall, and window in your property look stunning. Start planning for the future today. Set your business up for success this year with 3M Window Film. Call Kansas City’s window tinting experts to get a quote today. Scottish Window Tinting provides the highest quality residential and commercial window film design and installation services to clients in Kansas City, Olathe, Independence, and Olathe. Contact us today to schedule your free consultation. Scottish Window Tinting is honored to announce our recent award on behalf of Eastman and Llumar SelectPro for “Best in the West” window film contractor. As the Western Vista dealer of the year, we’re humbled by the recognition of our work ethic, consistency, and dedication to our customers and community. We strive to continue being the recognized leader in our industry and are proud of our recent accomplishments, our hard working team, and all of our wonderful clients.